We’re looking for a program officer (or “health scientist administrator”) to oversee grants and other activities related to social and behavior modeling—a research area that complements NIGMS-supported efforts to understand complex systems, including disease spread among human populations and dynamics in model organism communities. The job is within the NIGMS Center for Bioinformatics and Computational Biology. 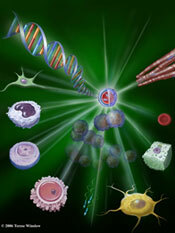 The center supports research and training programs that address the computational needs of today’s biomedical research, serving critical roles across NIGMS as well as NIH. Please see the job announcement for more details and forward this information to anyone who might be interested in this position. Individual inquiries can be sent to me. The listing closes November 13, 2009. The annual Hispanic Heritage Month recognizes the contributions of Hispanic Americans to the United States and celebrates Hispanic heritage and culture. The end of this year’s observation coincided with the opening ceremony of the Society for Advancement of Chicanos and Native Americans in Science (SACNAS) National Conference, which is supported by NIGMS. The SACNAS conference highlights the scientific contributions of Hispanics and Native Americans and fosters the development of new scientists. This year’s more than 2,500 attendees, including more than 1,000 undergraduate students, made it the largest SACNAS conference to date. The impressive talents and skills of the “budding” scientists were evident not only in their poster and oral presentations, but also in their conversations with established researchers, educators and mentors. During the conference, SACNAS honored the significant roles of three NIGMS grantees by giving them its highest awards. Jorge Gardea-Torresdey received the 2009 Distinguished Scientist Award, Frank T. Bayliss received the 2009 Distinguished Undergraduate Institution Mentor Award and Maria Fatima Lima received the 2009 Distinguished Professional Mentor Award. Hispanics are the largest and fastest-growing minority in the United States, and they are contributing to all aspects of the fabric and economy of this country. Although there are a number of very prominent Hispanic scientists, there is still a dearth of Hispanics pursuing Ph.D. degrees and research careers. Through its conference and other activities, SACNAS is contributing to NIGMS efforts to encourage and support students who are interested in science, including those from underrepresented groups. Last month, Jeremy Berg announced that NIGMS is holding a two-day workshop for postdoctoral fellows who will soon transition to their first independent positions. The event will take place on the NIH campus in Bethesda, MD, March 11-12, 2010, and the deadline for applications is just a few weeks away (November 2). While we received a strong response, we still have some space available. As chair of the NIGMS committee organizing this special workshop, I want to emphasize what a great opportunity it will be for transitioning postdocs, especially ones from groups underrepresented in the biomedical and behavioral sciences. Since NIGMS has a strong interest in encouraging a diverse scientific workforce, we are excited to host a workshop that will help a wide range of transitioning postdocs. The workshop will provide practical advice about applying and interviewing for jobs, negotiating start-up packages, finding a mentor, establishing a lab, forming collaborations, getting tenure, balancing research with other commitments and much more. The agenda features a fabulous lineup of speakers, including many well-established academic scientists, who will share their experiences and offer tips. Please consider applying or forwarding this information to eligible postdocs in your lab. Fiscal Year 2009 is now complete. In addition to distributing the funds associated with the NIGMS regular appropriation of nearly $2 billion, we were able to commit $463 million in Recovery Act funds (out of the $505 million allocated to NIGMS and approximately $21 million more provided to us by the NIH Office of the Director). We estimate that we have $63 million more to spend in Fiscal Year 2010. See the end of this post for more on our plans. This plot shows the percentage by activity of total NIGMS Recovery Act funds (including the $505 million allocated to NIGMS and the approximately $21 million in additional funds that the NIH Office of the Director provided to support 17 Challenge grants and to co-fund the Grand Opportunity (GO) grants) (left) and the total amount awarded (including year 2 commitments, if any) (right). The number of awards in each activity is shown over each bar. The “Other” category includes a small number of awards in a range of activities, including supplements to K08, K99, R00, P01 and U01 mechanisms. More details about these awards can be found in NIH RePORTER. Let me briefly describe the decision-making processes that led to this distribution. We set aside funds to support 15 Challenge grants (in addition to the Challenge grants assigned to NIGMS but supported by Recovery Act funds from the NIH Office of the Director), approximately 1 Grand Opportunity grant in each of the 10 NIGMS areas of interest and 20 Faculty start-up (P30) grants. Most of the remaining Recovery Act funds were allocated to the five NIGMS divisions and centers in proportion to their percentage of NIGMS funding. For activities that had undergone recent peer review, such as Challenge (RC1) grant applications, R01 applications, AREA (R15) grant applications and competitive revisions, priority scores and—in many cases—the current availability of funds within investigators’ laboratories were major factors in determining funding priority. For administrative supplements to grants that had been previously peer reviewed and funded, program directors took a number of factors into account, with the goal of attempting to maximize the potential impact of the portfolio of Recovery Act awards on the American scientific enterprise. First, the proposed research had to be within the scope of the original funded grant. Additional considerations included the potential impact of the proposed funding on the specific aims of the grant; NIGMS portfolio balance; whether investigators had received other Recovery Act support; the economic stimulus impact of the funding; and the distribution of funds across regions, states and institutions. Overall, we were able to support approximately 40% of the administrative supplement requests that we received. Approximately 10% of our Recovery Act funds remain to be invested in Fiscal Year 2010. We plan to use most of these funds to support—for up to one year—administrative supplements, competitive revisions and other applications that have already been submitted. This means that we are still considering funding a modest number of previously submitted administrative supplement requests and other awards with our limited remaining Recovery Act funds. It has been very gratifying to see outstanding female scientists appropriately recognized in the Nobel Prize announcements this month. However, a variety of evidence reveals that, in many fields of science and engineering, women’s careers progress along different trajectories than do men’s careers. As I noted in a previous post, NIGMS has led an initiative to support social science research directed toward examining and developing a rigorous evidence base regarding the factors that influence women’s careers in the biomedical and behavioral sciences and engineering. This effort resulted in a new funding opportunity, and NIH announced last week that it had awarded 14 R01 grants. In addition to studying causal factors, such as family, finances and culture, the new research projects will also look at the role of mentoring, environment, funding support and other interventions. To learn more about the projects, search NIH RePORTER by RFA-GM-09-012. With a total of $16.8 million in funding from 15 NIH institutes, centers and programmatic offices, these grants reflect NIH’s broad commitment to addressing these issues. We look forward to following the results over the next four years. I expect that they will have broad implications with regard to programs that promote the advancement of women’s careers in science and engineering, especially at critical junctures. Two major recommendations of the NIH Enhancing Peer Review Initiative were to shorten grant applications and restructure their content. These changes will affect applications due on or after January 25, 2010. Here’s a brief overview of the changes and their implementation. Be sure to follow the links for other details and important information. When submitting an application due on or after January 25, you must download the new application forms. You may sign up to be notified when new application packages become available, which will be in December. Applications submitted early must follow the instructions for the actual due date (e.g., applications submitted on January 24 for the February 5 R01 due date must use the new forms). You can begin working on your applications now and paste the text into the appropriate form when it’s available. NIH will not accept any applications using any part of the old forms, including biosketches. All existing Funding Opportunity Announcements (both electronic and paper) will be revised to incorporate these changes and will be reissued by December 2009. Parent announcements will be reissued and have new Funding Opportunity Announcement numbers. If you have specific questions, please contact the NIH Grants Information Help Desk at grantsinfo@nih.gov. Remarkably, at the same 1987 “Evolution of Catalytic Function” Cold Spring Harbor meeting where I first met Carol Greider, I heard Ada Yonath describe her initial attempts to crystallize and determine the structure of the ribosome. Tom Steitz also spoke about his exciting structure determination of DNA polymerase I, and Peter Moore talked about his work on the ribosome using specific deuterium labeling and neutron scattering methods developed in part with Venki Ramakrishnan. The meeting was filled with the promise that we would one day visualize and begin to understand this elaborate RNA-protein machine in atomic detail. More than a decade later, that promise was realized, as recognized by today’s announcement. The Nobel committee has the daunting challenge of limiting itself to up to three laureates for each prize. Several other long-time NIGMS grantees who also contributed greatly to our understanding of the structure and function of the ribosome include Peter Moore, Harry Noller and Joachim Frank. I remember very well the presentation by then-graduate student Carol Greider at the 1987 Cold Spring Harbor Symposium on Quantitative Biology about her purification and initial characterization of telomerase and component RNA. Her passion and enthusiasm for science stood out, even in that high-powered crowd. I also enjoyed working with her when we were colleagues at Johns Hopkins before I came to NIGMS. The work of Blackburn, Greider and Szostak represents an archetype of curiosity-driven basic research. The fact that DNA synthesis requires a template creates a clear challenge to copying the ends of DNA. The reality of this challenge was clear from Szostak’s studies with linear DNA molecules in yeast. Using a model organism (Tetrahymena) selected for its unusually high abundance of DNA ends, Blackburn’s lab identified telomere sequences and showed, with Szostak, that these sequences did, in fact, stabilize linear DNA molecules in yeast. Blackburn and Greider then set out to detect and purify the enzyme that adds telomeres to DNA. After their success, they and many other researchers have explored the implications of these observations as they relate to cancer, cellular aging and stem cells. In the years to come, we can expect to see additional implications and broad exploitation of these observations.